﻿ Hebrews 11:4 By faith Abel offered to God a better sacrifice than Cain, through which he obtained the testimony that he was righteous, God testifying about his gifts, and through faith, though he is dead, he still speaks. By faith Abel offered to God a better sacrifice than Cain [did]. By this he was approved as a righteous man, because God approved his gifts, and even though he is dead, he still speaks through this. By faith Abel offered to God a better sacrifice than Cain, because of which he was reported to be righteous, God testifying about his gifts, and through it, he who died still speaks. By [having] faith, Abel offered to God a better sacrifice than Cain did. [And] because of his faith he was commended by God for being righteous, when God expressed approval of his offerings. By means of his faith, Abel still speaks [to us], even though he is dead. By faith Abel offered to God more sacrifice than Cain; on account of which he received testimony that he was righteous, God testifying of his gifts; and by it he, though dead, yet speaks. By faith Abel offered God a more acceptable sacrifice than Cain, through which he was commended as a righteous man, when God spoke well of his gifts. And through faith he still speaks, even though he is dead. 'Twas by faith that Abel offered unto God a more excellent sacrifice than Cain, by which he was declared righteous, God himself having testified that he accepted his offering, and after he died for his faith, he was not silent. By faith Abel offered up to God a more acceptable sacrifice than Cain, through which he received the witness that he was righteous, God witnessing to his gifts: and through it he having died is still speaking. 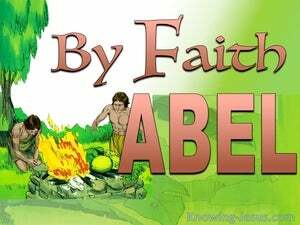 Faith made Abel's sacrifice greater in the sight of God than Cain's; through faith he gained God's approval as an upright man, for God himself approved his offering, and through faith even when he was dead he still spoke. By faith Abel offered unto God a more excellent sacrifice than Cain, by which he obtained a testimony that he was righteous, God testifying of his gifts; and by it, being dead he yet speaketh. By faith Abel offered unto God a more excellent sacrifice than Cain, by which he obtained witness that he was righteous, God testifying of his gifts, and by it he being dead yet speaks. By faith Abel brought near a greater sacrifice to God than Cain, by which he was testified of to be just, God testifying of his gifts; and by it he being dead yet speaks. By faith Abel offered to God a greater sacrifice than Cain, by which he was approved that he was righteous, [because] God approved [him] for his gifts, and through it he still speaks, [although he] is dead. By faith Abel offered to God a more excellent sacrifice than Cain, by which he obtained witness that he was righteous, God testifying of his gifts. And by it he, being dead, yet speaks. By faith, Abel offered unto God a more plenteous sacrifice than Cain: by which he obtained witness that he was righteous, God testifying of his gifts: by which also he being dead, yet speaketh. It was by faith that Abel offered God a richer sacrifice than Cain did, and thus won from God the record of being 'just,' on the score of what he gave; he died, but by his faith he is speaking to us still. By faith Abel offered to God a sacrifice more acceptable than that of Cain, through which he had witness borne to him that he was righteous, God giving the testimony by accepting his gifts; and through it he, although he is dead, still speaks. By faith Abel offered to God a more excellent sacrifice than Cain, through which he received testimony that he was righteous, God testifying of his gifts; and by it though dead he yet speaketh. By faith Abel offered to God a greater sacrifice than Cain, through which he was declared to be righteous, God testifying to his gifts, and through the same, having died, he speaks still. By faith, a fuller sacrifice, did Abel, offer unto God, than Cain, - through which, he received witness that he was righteous, there being a witnessing upon his gifts, by God; and, through it, though he died, he yet is speaking. By faith Abel offered unto God a sacrifice of more excellence than Cain, by which he received a testimony that he was a righteous man, God bearing witness upon his gifts: and by this, though dead, he still speaketh. Faith made the sacrifice which Abel offered to God a better sacrifice than Cain's, and won him renown as a righteous man, God himself establishing his renown by accepting his gifts; and it is by the example of his faith that Abel, though dead, still speaks. Through faith Abel offered to God a more acceptable sacrifice than Cain did, and through this faith he obtained testimony that he was righteous, God giving the testimony by accepting his gifts; and through it, though he is dead, he still speaks. By faith Abel offered a sacrifice more acceptable to God than Cain did, for by it he was approved as an upright man, since God approved him for the offering he made; and by it he still continues to speak, though dead. By faith Abel offered to God a more excellent sacrifice than Cain, through which he received witness that he was righteous, God testifying of his gifts; and through it he, being dead, is still speaking. By faith Abel offered unto God a more excellent sacrifice than Cain, by which he obtained the testimony that he was righteous, God bearing witness to his gifts: and by it, though dead, he yet speaketh. 3 By faith we understand that the worlds were prepared by the word of God, so that what is seen was not made out of things which are visible. 4 By faith Abel offered to God a better sacrifice than Cain, through which he obtained the testimony that he was righteous, God testifying about his gifts, and through faith, though he is dead, he still speaks. 5 By faith Enoch was taken up so that he would not see death; AND HE WAS NOT FOUND BECAUSE GOD TOOK HIM UP; for he obtained the witness that before his being taken up he was pleasing to God.